Le Creuset's collections include a variety of roasting pans. The Enameled Cast Iron Collection features Roasting Pans range in two sizes, 5.25qt to 7qt. Le Creuset's enameled cast iron roasting pans distribute heat well and are perfect for oven roasting chicken, beef, lamb, casseroles or other dishes. 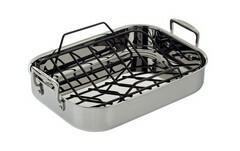 The Stainless Steel Collection includes a roasting pan with a non-stick rack. 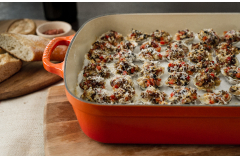 The Stoneware Collection includes various large rectangular casserole and au gratin dishes that are great for roasting small proteins or vegetables.